The summer is the wedding season, so I was kept very busy visiting beautiful venues and entertaining parties of lovely people – it’s a tough life! Here’s what happened in just a few of the weddings and events I was asked to provide the magic for. After seeing me perform at a friend’s wedding, Emma and Peter hired me for their own. They got married at Theobalds Park in Cheshunt, an elegant Georgian mansion which is set in beautiful, landscaped grounds and parkland. I spent one hour at the drinks reception doing magic for their hundred guests, then another hour entertaining them between courses at dinner. 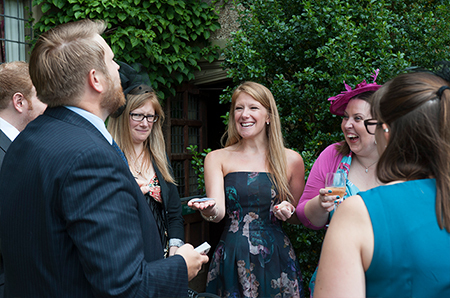 The magic at the drinks reception really got people talking, so when I was going round the tables, they were ready to join in the fun, which really helped create a lively, buzzing atmosphere. At the end of August, I was asked to perform at the luxurious Four Seasons Hotel in London. I provided the surprise entertainment for a magic lover’s 50th birthday party and divided by time between the drinks reception and sit down meal for the 60 guests. The four star Letchworth Hall Hotel was the setting for an Indian wedding for 200 guests. I was booked for a total of three hours, but was performing throughout the night in order to bring the day guests and evening guests together. Lots of things going on with special dances and drummers,the magic really helped bring groups of guests together. It was a real talking point and added a real wow factor to a special day. I entertained 75 wedding guests at the beautiful Priory Barn in Little Wymondley which provided a stunning setting for Sophie and Craig’s wedding. They’d got other fun activities organised for their two hour drinks reception, including garden games and an ice cream van! But my role was as ice breaker to bring the two families together, and am really pleased to say it worked brilliantly. If you would like to see the kind of magic I can bring to your wedding or event, click here to watch my latest video.